Representatives for Effective Space, a U.K. based space technology company, have announced to the press that a deal has been struck between their company and a well-known satellite operator to provide satellite support in orbit. The support, in this case, will involve placing two drones on a rocket, sending them into space and then using them to rescue two satellites that are about to run out of fuel. Long-term satellites have a limited amount of fuel to power the course-correction jets that keep the satellites positioned correctly. But such satellites, which generally hover in a geosynchronous orbit, typically carry only enough fuel to last for 15 years. After that, the satellites roam free as space junk. Space scientists have for years called on countries that launch satellites to find a way to extend the life of satellites, or at least change their trajectories toward Earth, to burn up on reentry—this is because there is only so much space available for satellites to orbit. Noting that it is getting pretty crowded up there, the group that formed Effective Space is gambling that the time is right for a company that makes and operates drones able to both rejuvenate aging satellites or drag them to their graves. The representatives for Effective Space told the press that they will launch two drones into space in 2020, both of which will attach to satellites that are about to run out of fuel. Once attached, the drones will take over positioning duties for several years. If the satellites malfunction for other reasons, the drones will steer them into a self-destruct spiral and then redeploy to service other satellites—each drone has a life of 15 years. 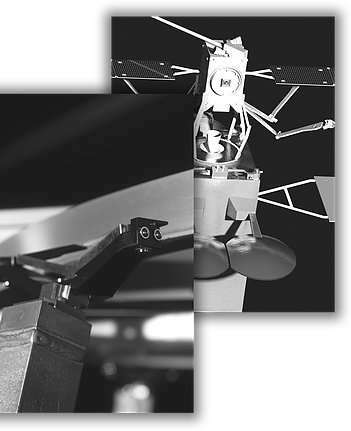 Each of the drones, the reps reported, have the mechanical wherewithal to attach to a satellite in the same fashion as was used to stabilize the satellite while it was boosted into space by a rocket. The agreement between Effective Space and the undisclosed satellite operator is believed to be one of the first of its kind, though most in the field expect competition to heat up if the company is successful in extending the life of satellites.